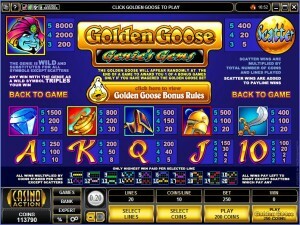 In Golden Goose – Genie’s Gems, you are going to discover one of the four slot machines from the Golden Goose series. Each one has a different secondary title and theme, but the Golden Goose bonus game is always available, and it’s the same thing in each case. Otherwise, the Genie and the lamp are the main protagonists of this slot machine, which uses graphics that are as basic and crude as they are in other titles from the series. 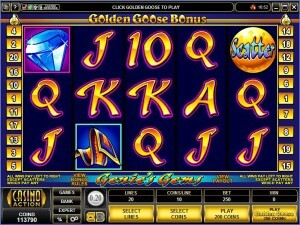 5 reels and 20 lines are offered in Genie’s Gems, just like in the rest of the Golden Goose slots. The features are mostly the same ones, the wild coming with a multiplier, the scatter symbol giving away big prizes and the bonus feature started with the extra bet activated. The jackpot in this game reaches $16,000. The game does at least one thing better than the Crazy Chameleons title, it uses a 3x multiplier for the wins that come with the wild’s help. The scatter symbol is the same, and you also have the Golden Goose bonus game, should you decide to wager extra for it. The Genie symbol is the most important one of the game, and I say this because of the top jackpot that is awarded with its help, though the wild ability and the multiplier are also very important. The jackpot goes up to 8,000x, for which you need to land five Genie wilds on the same active line. As the wild, the Genie substitutes for another symbol, and if you manage to create a combo where it had a contribution the payout will be tripled thanks to it. The 3x multiplier that comes with the wild will make sure of that. The other feature symbol is the scatter, a gold round ball being used for it. This scatter is just as impressive as in other games from the Golden Goose series, offering a payout of 400 times the bet when five of them are in place. The smallest payouts are given for at least three scatters. 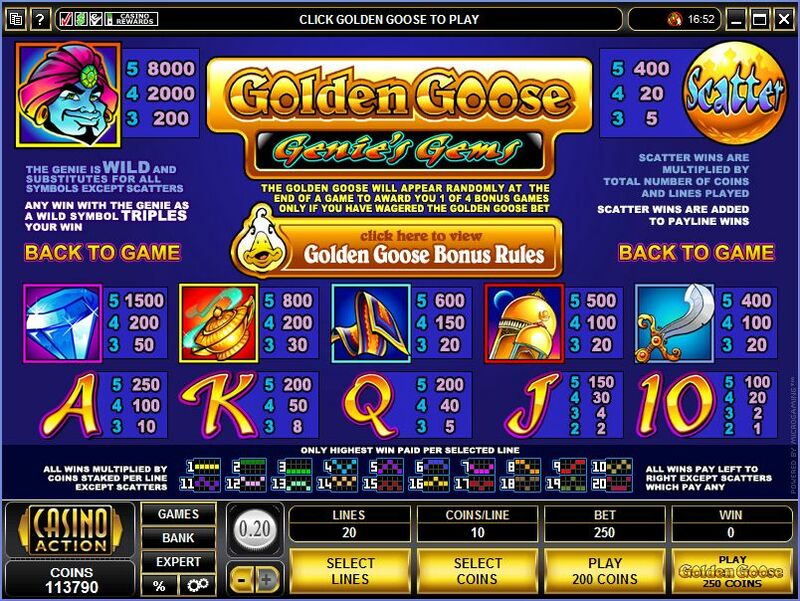 The bonus game of Golden Goose gets started when the player uses the Golden Goose extra bet, which will increase the wager by 25%, from 200 to 250 coins. When the player uses this extra bet, he gets a random chance each round to trigger the bonus feature and one of the four rounds available in it. The first of the four bonus games awards free spins and big multipliers, but first you have to pick a card in order to find out what your reward is. Up to 11 free spins and up to 6x multipliers are offered once you make your choice. Next, we have a set of five reels where golden eggs are used instead of symbols. 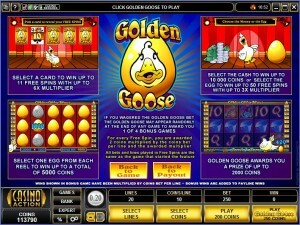 You have to pick a single golden egg from each of the five reels, getting a chance at a 1,000 coins prize in each case. With a bit of luck, you can walk away with up to 5,000 coins. The third feature that can be triggered is the one where you pick the egg or the money. Both are visible near the goose, and the egg can give you a maximum of 50 spins for free and 3x multipliers. The cash prize is worth up to 10,000 coins. The fourth and final feature is the one that simply rewards you with a bonus prize. You can get up to 2,000 coins thanks to it. The way you place bets in Genie’s Gems is similar to the system used in the other games from the series. You have wagers of up to $2 per line, or $40 total, to which you can add an extra $10 as an extra bet. The line bet uses 10 coins of $0.20 at its highest level. The extra bet allows you to activate the bonus games, which will then be triggered at random. The game promises top payouts of 8,000x, which in this case means $16,000, without taking into account the extra bet which is only for the bonus feature. The design of Genie’s Gems is very simple, the playing cards being identical in the way they were created, using the same Arabic style and the same colors. The rest of the symbols are related to the Genie theme, not to the golden goose. Overall, it’s not a game I’d play because of the design, more like despite of it. Symbols: Genie (wild, 8,000x), Scatter (400x bet), Diamond (1,500x), Lamp (800x), Magic Carpet (600x), Tower (500x), Sword (400x), Ace (250x), King (200x), Queen (200x), Jack (150x) and Ten (100x). 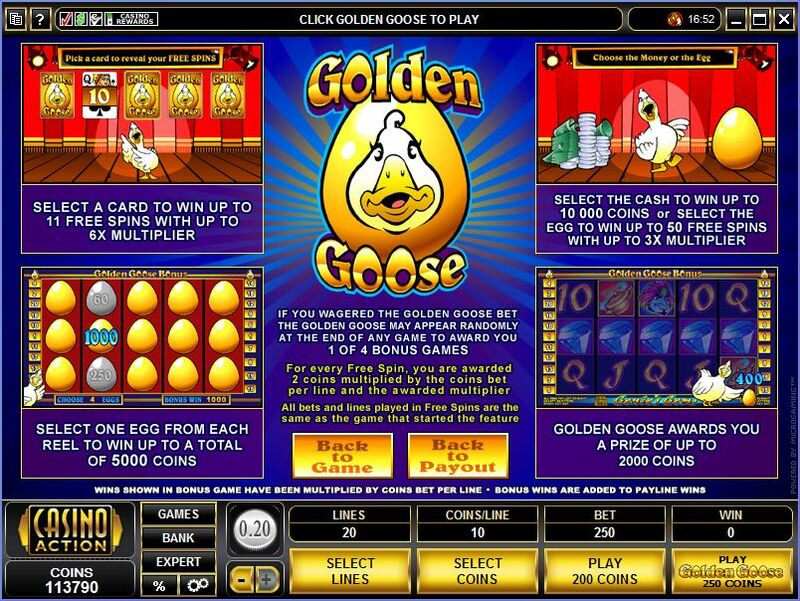 The prizes are better than in other Golden Goose slots, but it’s not the highest one, and you have a multiplier from the wild, plus big scatter prizes. I’d say it’s one of the better ones, and if you don’t have a problem with the genie theme I’d say try it out at least. 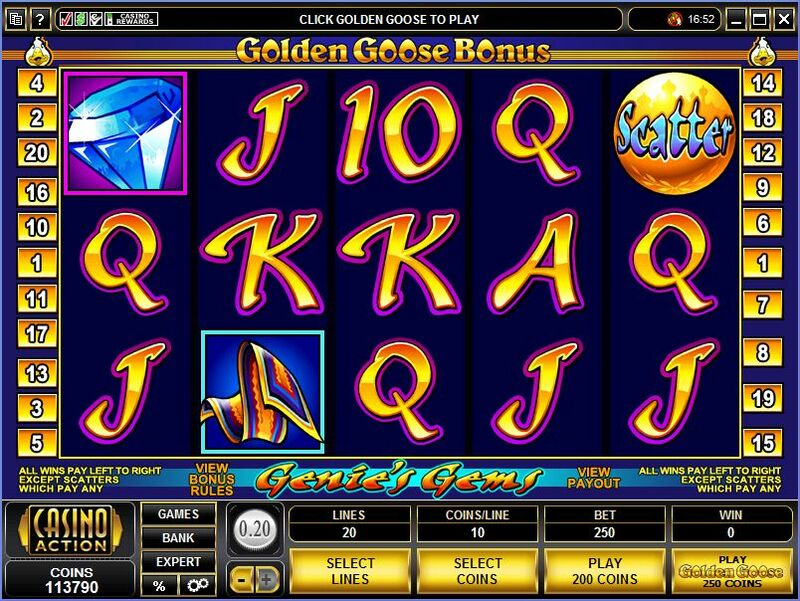 Golden Goose – Genie’s Gems can be found at any Microgaming casino, where you get a chance to play it for real money or in free mode.